Well it's that time of the week again! Suday. And that means it's time for In My Postbox! 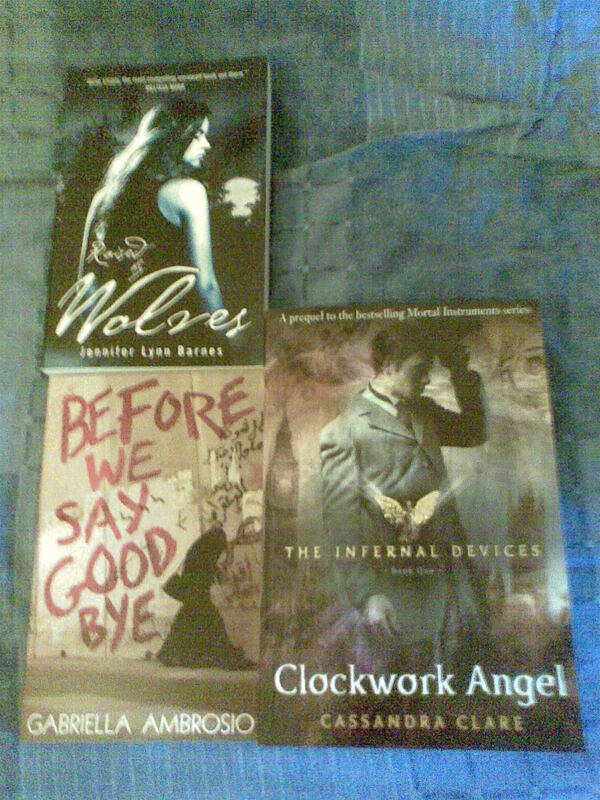 I got some really exciting books this week, so here goes! Raised By Wolves by Jennifer Lynn Barnes. "Pack life is about order, but Bryn is about to push all the limits, with hair-raising results. At the age of four, Bryn watched a rabid werewolf brutally murder her parents. Alone in the world, she was rescued and taken in by Callum, the alpha of his pack. Now fifteen, Bryn's been as a human among werewolves, adhering to pack rule. Little fazes her. But the pack's been keeping a secret, and when Bryn goes exploring against Callum's orders, she finds Chase, a newly turned teen Were locked in a cage. Terrifying memories of the attack on her parents come flooding back. Bryn needs answers, and she needs Chase to get them. Suddenly, all allegiances to the pack no longer matter. It's Bryn and Chase against the werewolf world, whatever the consequences. A thrilling new YA adventure, with an electrifying link between a tough heroine and an exciting boy-were at its heart, Raised by Wolves will leave you howling for more." I hadn't actually heard of this so it was a nice surprise when it came through my postbox the other day. The cover is very cool. Very shiny. Looking forward to having a read! Thanks to Quercus for this one! Before We Say Goodbye by Gabriella Ambrosio. "It is seven a.m. on a spring morning in Jerusalem. Eighteen-year-old Dima trudges through the mud to college and reflects on many things, including her forthcoming marriage to her cousin Faris. Seventeen-year-old Myriam skips school to sit on the tree-lined hill overlooking the city and think about her friend Michael, whose death she still mourns. And Dima’s and Myriam’s families – one Palestinian, one Israeli – go about their ordinary, separate lives; for today is like every other day. Yet in seven hours’ time, everything will have changed. For ever." This sounds absolutely amazing and I cannot wait to get started. The cover is brilliant! Thanks to Sean at Walker for this! "Magic is dangerous - but love is more dangerous still... When sixteen-year-old Tessa Gray arrives in England during the reign of Queen Victoria, something terrifying is waiting for her in London's Downworld, where vampires, warlocks and other supernatural folk stalk the gaslit streets. Friendless and hunted, Tessa seeks refuge with the Shadowhunters, a band of warriors dedicated to ridding the world of demons. Drawn ever deeper into their world, she finds herself fascinated by - and torn between - two best friends, and quickly realizes that love may be the most dangerous magic of all." Really looking forward to reading this one. It's huge! Such a big book! Thanks, again, to Sean at Walker for this one! So there you go! 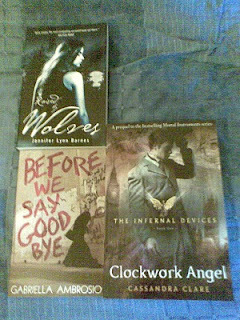 Those are the lovelies I got this week! What did you get? Hope you have a great week. Also, just as a (pretty pointless extra), when I was taking my post that you see at the top of this post, 2 thirds of my cats would not move at all. 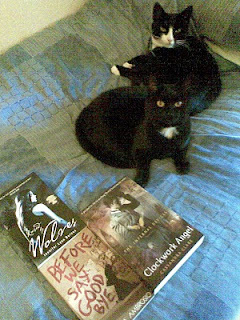 So I took a pic of them next to the books seeing as they seemed so keen to get into it! Haha. The one with white on her face is Smudge, and the totally black one is (mine, me and my sisters have one each) Pepsi. Both are looking petty evil. Huh. Oh well. Haha! Your cats are so cute - the ooks are as well. I absolutely loved Raised By Wolves and I cant wait to read Before We Say Goodbye!! 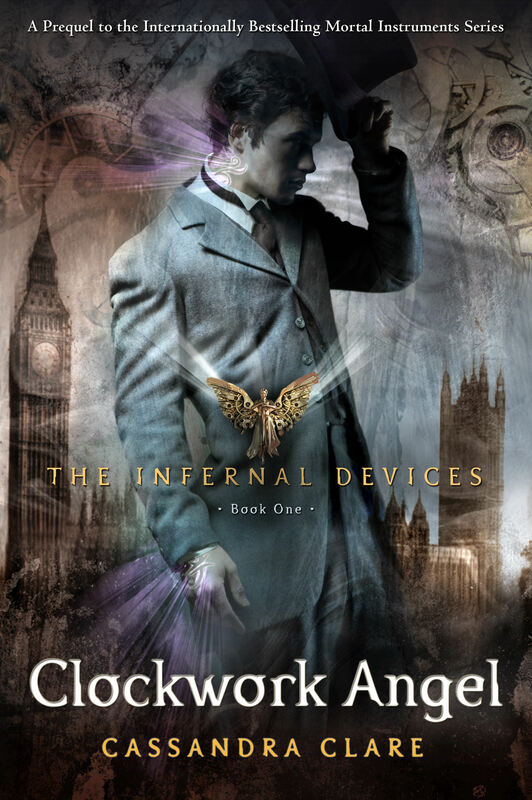 I loved both Raised by Wolves and Clockwork Angel, I can't wait to see what you think! And your cats are too cute. Enjoy your reads this week! Cute cats! I have two of my own. I'm a new follower and here is my mailbox.